(SKNIS): Nineteen (19) recruits passed out as soldiers on August 17, after successfully completing the Basic Military Course No. 19, which ran for 17 weeks. 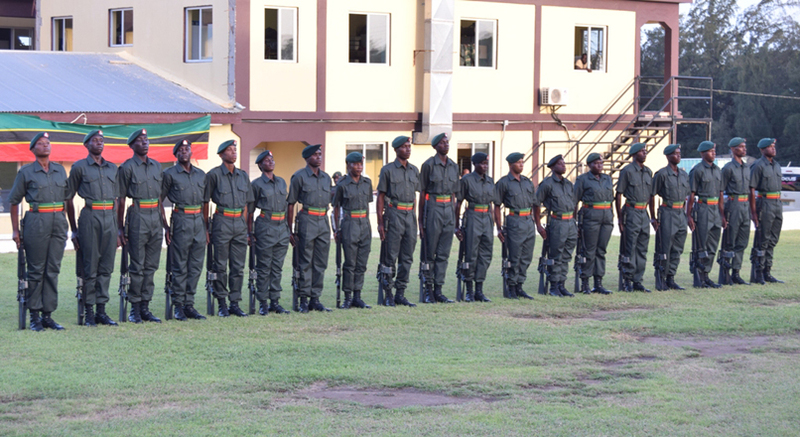 They all participated in the Passing out Parade at Camp Springfield, which marked their official transition into the St. Kitts-Nevis Defence Force. Warrant Officer Class Two (WO2), Althea France, Course Officer, gave a brief outline and overview of the course, noting that the Passing out Parade was the culmination of one of the most challenging, grueling and exciting periods in a soldier’s budding military career. WO2 France complimented all recruits for a job well done. “31 young persons – 21males and ten 10 females – reported to Camp Springfield on 18 April, 2017, to begin basic military training as the St. Kitts Nevis Defence Force (SKNDF) Basic Military Course Number 19 (BMC No 19),” she said. She said that the objective of the course was to produce physically fit, loyal, disciplined and competent soldiers, who possess the fundamental skills necessary for service in the St Kitts-Nevis Defence Force. The major part of the training was conducted at Camp Springfield. The field training exercises were conducted in Wingfield and Phillips mountains. For the BMC there are two compulsory subjects for graduation that students had to pass: Map and Compass, as well as Physical Fitness. Of the 19 graduating recruits, WO2 France said that eight were able to meet a much higher grade than the required standard, nine recruits frequently performed above the required standard, while two recruits met the required standard. Special awards went to several students: best at map reading – Dorville Eddy; best at field craft – Sherika Jhagroo; Best in physical fitness – Kiran Malcolm; best in drills – Caleb Davis; best pistol shot – Dishon Rawlins; most improved student – Kenroy Pemberton; and Clyon Saunders received awards for best rifle shot, most disciplined student and best graduating student. Prime Minister and Minister of National Security, Dr. the Honourable Timothy Harris, told the recruits that the country needed more men and women in uniform and wished them well. Mrs. Cynthia Morton who gave a motivational speech to the recruits during their training told them that she was impressed with their interest and desire to make the country proud.